To celebrate all of the unique ways that Seattle gets around, we’re doing something special for our friends down in Santa Monica, CA. We’ve hired 10 pedicabs, all wrapped up in pretty Seattle skylines, and we plan on making their last weekend in town (October 27 & 28) free for everyone! 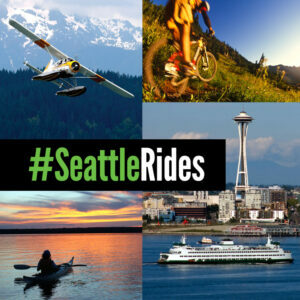 We are asking for your help, however, to show off Seattle and show those LA residents how we roll! 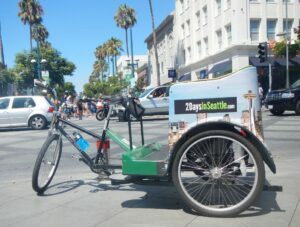 If people tweet photos of fun and unique Seattle modes of transportation to the hashtag #SeattleRides, we’re unlocking free pedicabs and we get to show Santa Monica how awesome and generous this town is. Maybe we’ll even inspire them to take a little trip up here to visit us. We need your help, Seattle! Let’s get tweeting!